Watching the latest videos posted by the Islamic State in Syria and the Levant (ISIL, or ISIS, IS), it is easy to see the changes in cinematic technique and the group’s choice of English as the main language. Their latest video, showing Jordanian pilot Moaz Kasasbeh being burned alive, sets a new precedent for brutality, ruthlessness, and high quality propaganda. Ramallah — Before ISIL, most jihadist videos only documented various kinds of combat operations. The camera was always present to record the battles, to be incorporated in a single tape as part of a detailed report, which was released periodically as part of the counter-propaganda through which the group was trying to compete with the global media. In the nineties, the video “Russian's Hell (Chechen Mujahideen)” set an unusual precedent. Youths rushed to watch and share the video, and jihadist songs were recorded on cassette tapes. Islamist fighters witnessed a period of glory in Afghanistan. Anecdotes about God supporting them and sending angels to fight with them went unquestioned. This was before everyone realized, years later, that the angels were highly-accurate US missiles. Today, we are witnessing a completely different era, marked by a jihadist movement far more advanced than anything we have seen before. They coincide with a far more sophisticated viewership, who have access to the source of information and can scrutinize any image. Today’s viewers, who live in an age of instability where conspiracy theories prevails, have come to question everything. There is a direct relation between the new public psychology and ISIS’ new style of audiovisual production. Increasing suspicion has to be met with greater propaganda. Jihadist forums discuss the appearance of the first media follow-up units of the jihadi groups, which have started filming videos with a storyline. It was simple, specifically with the “Mujahideen Shura Council” group. According to the script, the photographer is required to follow and capture the suicide bomber, especially when the bomber appears to be loving his life: we see the would-be suicide bomber swimming in a river, eating fruits, making a light joke before walking to the camera and talking about the bliss of Jihad. In the next scene, the man reads out his will, before we see him driving in the booby-trapped car bomb in the darkness of night. He touches the car with his hands, as if stroking a familiar pet. His eyes shine because of the night photography technology used by the photographer. The whole scene is bathed in green light, then a distinctive button emerges from this uniform color. He says that this simple little button is his key to heaven and its doe-eyed women (houris). It's simple: just press this button. You won’t feel a thing. Since the emergence of ISIL, a group that declared itself an Islamic state in Iraq and the Levant, the group’s media strategy has passed through several stages. Although these stages are a major leap in creative terms, it is necessary to discuss this advancement and its significance, rather than just its technical characteristics. Although the company existed previously, the name al-Hayat Media Center (HMC) makes an appearance in every ISIL production and video. The group has moved from recording events with regular cameras, to becoming a media strategy organization whose task is to shape the group’s upcoming messages to the world, and to convey the message of the Mujahideen, who “with their blood are marking a new era of victory for the nation in history.” Accordingly, what distinguishes ISIL from other jihadi movements is its ability to attract the Muslims of Europe. Editing programs and high resolution cameras existed well before ISIS. But why have professionally edited, English-speaking videos appeared only recently? Video editing and filmmaking professionals can easily recognize professional work. These films were obviously made by persons who studied the craft, and probably acquired experience in a European creative environment, not through the amateurish YouTube videos. The latest ISIL videos — “Salil al-Sawarem,” “The Flames of War,” “In Spite of Unbelievers,” and “Healing Hearts” (featuring Jordanian pilot Moaz Kasasbeh being burned alive on Tuesday), clearly betrayed a shift in cinematic technique, and the shift to English as a main language. In “The Flames of War,” for example, slow motion effects were employed in a highly professional manner, which is uncommon in filming real-life videos. A suicide bomber raids an enemy center and blows himself up. His militant comrades step in later. One of them gets wounded while running. Abu Musab al-Zarqawi’s mobilizing words and a sad song play in the background. ISIS soldiers are seen running in the background. The man lies wounded on the ground. The photographer continues to capture this moving scene from afar. The man bleeds for a long time, while the photographer continues to take various shots. The wounded soldier dies. The scene ends. The photographer was finally able to capture his shot. The scene returns to normal speed. “The Flames of War” ends with perhaps the harshest scene ever. The English-speaking ISIS member stands in front of the group’s flag. Behind him, a number of men are seen digging in the ground. Seconds later, we learn that they are digging their own graves. ISIL adopts a similar technique in all its videos, in which prisoners express apologies and regrets before their death. We know that ISIL does not keep prisoners, opting instead to kill them. Still, prisoners always appear in the videos trying to appease the soldiers, to no avail. We see the prisoners lined up in an execution-style position: sitting on their knees with their hands tied behind their backs. With small pistols this time, the soldiers fire several shots at the head of each victim. From another angle, again, we see all prisoners fall in the hole they have dug themselves. This execution scene was unusual at the time. But after the release of the short movie “In Spite of Unbelievers,” it is fair to say that ISIL’ visual production has assumed a new dimension. Here, there are clear directorial directives based on a pre-planned and agreed-upon scenario. But only the executioners know the director’s orders. The scene opens with a number of ISIL soldiers from different nationalities, as is evident from their physical appearance. Each one of them holds the neck of another man. The prisoners walk with their faces down and are herded like sheep by their slaughterers. On the side of the screen, there is a wooden box containing a number of new knives. Each ISIL soldier walks past the box and removes a knife without looking at the camera. They walk in a line until there are no more knives. In the next scene, the prisoners are made to sit on their knees, in an execution position, with a slaughterer behind each one. With a high level of craftsmanship using at least three cameras, the soldiers are seen passing the knives through their fingers, while a look of confusion appears on the faces of the prisoners. An ISIL member begins to speak in English. Then comes the most elaborate scene in the history of jihadi film-making: the slaughter scene. You can only hear the sound of the air. All sounds were intentionally muted to create an atmosphere of anticipation. This is how ISIS wanted it, and this is how we unconsciously deal with it. The knife grazes the prisoner's neck. The sound of tearing flesh can be heard clearly. The sound bite was obtained from foreign video-editing sites, and was masterfully inserted into this scene. Plenty of blood is seen, and even heard, pouring. In slow motion, the leader of the slaughterers stares at us. It is not a common stare. It is the look of death, which cannot be explained. But it came in response to a strict directorial command, whereby the man was directed to look at the camera before slitting the man's neck. The scene ends with a shot of the heads placed on the bodies they were severed from. 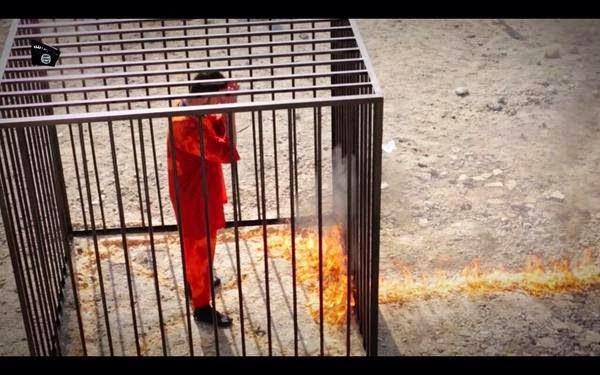 The latest ISIS video, showing Jordanian pilot Moaz al-Kasasbeh being burned alive while confined in a cage, has a feature we know from previous ISIS video productions. It opens with an assertion of the defeat of the enemy and the destruction of its aides. What’s new, however, is the masterful narration in the first half of the film. This masterful use of various editing programs is probably the work of a respectable television station, unless we assume that Kasasbeh was executed a month before the release of the film. In addition to political factors, the release may have been delayed to allow the completion of the film, which takes a long time. Among the justifications offered by ISIL in the film, the pilot offers a detailed account of the events that led to his capture by the terrorist group. Here, we are presented with all reasons that “demand” the man's execution, and this time the man himself presents these reasons. Meanwhile, the viewer realizes that the man will inevitably die. But how? The pilot, dressed in an orange jumpsuit, is shown in a state of confusion, perhaps surrendering. Scenes of him walking strangely are intercut with flashbacks. The director inserts footage of previous events into the scene, a technique often used to link the current story with its causes. Here, ISIL presents the second justification to viewers. We have gotten used to one thing: the more elaborate the introductions and justifications, the harsher the end. Images of the pilot in captivity are interspersed with images of his glory days, flying a plane and bombing targets, and a sensational, cinematic scene of him standing in front of a group of uniformed ISIL soldiers in a torn down area, perhaps due to international coalition airstrikes. It’s the same military uniform ISIL members appeared in when the pilot was captured. They all carry identical guns. The man is standing, and we have no idea what he is thinking. He has probably stopped thinking. The terrible state of surrender and submission by all prisoners executed by ISIL can only be explained in two ways: The first and most likely theory is that ISIS soldiers perform a large number of mock executions on the victims, who face death many times before discovering that they will not die now, and thus reach a state of apathy. The second theory is that the victims have been anesthetized, and thus appear in a state of loss and indifference, or completely surrender to the ISIL knife. We see more flashbacks scenes. We see the bodies of ISIL victims, followed by shots of the face of the pilot in his orange jumpsuit, surrounded by the insurgents. Sound is muted. We can only hear the sounds of wind and breathing, and see the faces of angry militants and that of the surrendered pilot. The contrast of faces continues until the next scene. Suddenly, the pilot is seen inside the cage. His clothes are wet, and we discover understand that he was doused with a flammable liquid. His head is down. The video-maker demonstrates advanced editing skills, alternating between close-ups of the pilot's confused face and long-shots of him looking down at his feet. We see soldiers; there are always soldiers. We can hear no sound but the sound of wind. A song starts to play in the background, its volume gradually increasing. The video exhibits a professional sense for combining sound and imagery. Execution time has come. One of the soldiers sets the fire. The camera follows him from a higher angle. This method was used for the first time in the film: an attempt to further humiliate the victim by making him look small. This technique is known in the filmmaking industry — shooting from a lower angle makes the protagonist appear grand. In this case, the final scene, with the victim, was also filmed from a higher angle. What’s new in the film is that the orders came from the director to the victim, not the executioner, as in the video, “In Spite of Unbelievers.” The first orders are evident in the pilot’s walk in an orange jumpsuit in the first scene of the execution video. They are also evident in the rapid alternating images of the pilot’s confused face and with his face down. The prisoner looks up and then straight to the camera. His moves were certainly in response to the director’s orders. In one second, viewers can feel the humiliation and psychological destruction being felt by the victim. He is looking at you through the camera. It is his last look of confusion. The shooting of the film took considerable time. We know that from the sunlight that shone after the victim had been standing for a while in front of us. But the shooting location did not change. The most surprising thing in the film is the iron cage, which can be interpreted as a sign of a tragic fate. We are watching a man wearing an execution jumpsuit confined in a cage. This is an ordinary scene we see in courts across the world, but to be a hostage held by ISIL, the issue is beyond the cage and the jumpsuit. For the victim Moaz al-Kasasbeh, he was expected to receive a painful execution if a deal to release him was not reached. Yet, even more sinister minds could not have foresee his death by burning. Kasasbeh burns, and through sophisticated filmmaking techniques we experience all possible feelings. We could almost smell the burning. Words of Ibn Taymiyyah are shown on the screen. This is the third and final justification by ISIL in this film: Our actions are part of our faith. ISIL’ audiovisual achievements and propaganda cannot be ignored. This is an unprecedented phenomenon we are witnessing. The Islamist group is leading the media war, and its responses are not limited to dull documentation of events as was the case in Iraq years ago. Conspiracy theories have started to resurface. It has been said that these scenes were shot in high-budget studios, and must be backed by the CIA. However, observers of the development of productions by jihadi groups know that such theories are unfounded...and ultimately, the real tragedy here is that these videos are very real and authentic.